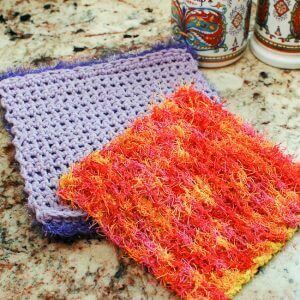 These scrubby dishcloths are the perfect all purpose cleaning cloths. They are double sided with a gentle cotton side for nonabrasive cleaning and a scrubby side for tougher jobs. Make a set for yourself or to give as a gift. Best of all, you can just throw them in the wash when you’re done and they’re good as new! Two sizes of these crochet dishcloth patterns are included below. Click here for more Crochet Dishcloth Patterns. Sizes: small = approx. 6 in. × 6 in. ; large = approx. 7 in. × 7 in. With cotton yarn, ch 20 (23). Row 2: Ch 1 (does not count as st here and throughout), work 1 sc in the back loop only of each st across, turn — 19 (22) sts. Row 3: Ch 1, work 1 sc in the front loop only of each st across, turn — 19 (22) sts. Row 4: Ch 1, work 1 sc in the back loop only of each st across, turn — 19 (22) sts. Rows 5 through 16 (20): Repeat rows 3 and 4. We are going to work the scrubby yarn on the ridged side of the dishcloth, that is, the side that shows the empty loops from each row. Starting from the bottom right, pull up a loop of the scrubby yarn in the first loop, ch 1 and work a sc in same loop, work 1 sc in each loop across, turn. Ch 1, work 1 sc in each loop across. My dishcloths curl on the ends after being washed. How can I prevent this? When you start crocheting with the scrubby yarn, do you only crochet into the bumps that stick out every other row, or in both the bumps that stick out and the other rows? It looks like the empty loops in every row. When you start to crochet with the scrubby yarn, at the end of the first row when it says “turn” does that mean to rotate or turn over to the other side of the dishcloth? Thanks so much. It looks to mean to turn the washcloth upside-down to work the next row. I made my first one and can’t wait to make more! I love this pattern, the simplicity is amazing! Thank you thank you! looking for directions crocheting dishcloth using only the scrubby yarn with a g or h crochet hook. 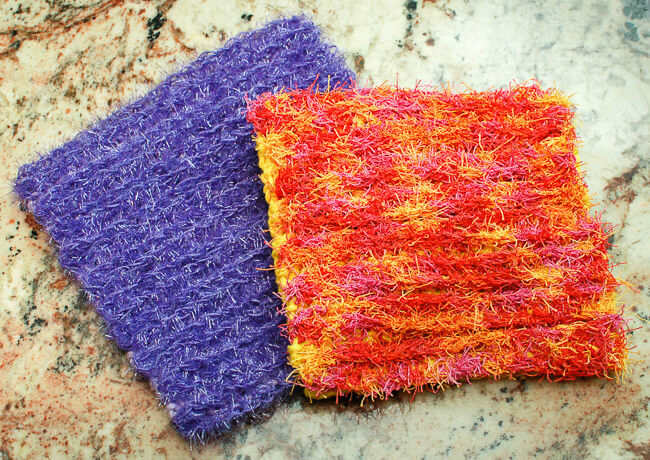 Any pattern you can use to make washcloths can be used to make scrubby clothes. What do the numbers behind the stitch count in parentheses mean? 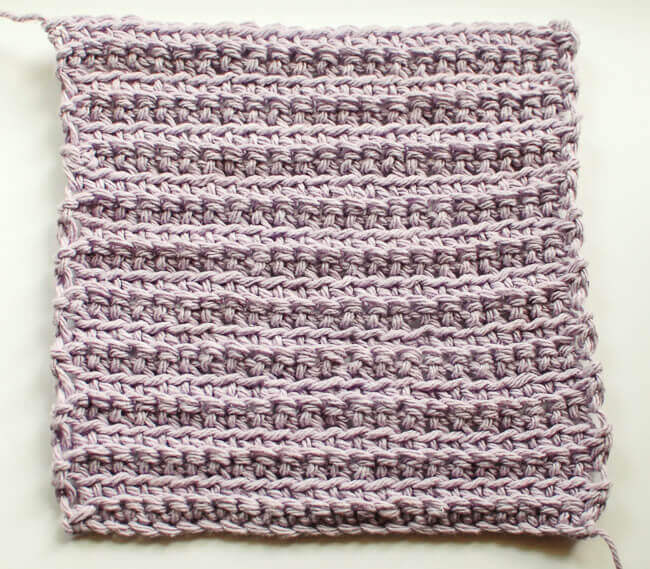 The stitch count is for the small washcloth, with changes for a larger size in parentheses. Can I print this pattern ? Hi Mary 🙂 at the bottom of the post are two small icons. One is to print and the other is to save as a PDF. Hope that helps! I don’t see the icons you refer to. Are they gone…? No, the print icon is still there on the top left of the post.